I switched to a Mac in early 2005 and although I don’t see myself ever willingly going back to Windows at home (I use it at work), the one area that makes me wish I was on a PC is personal finance software. I’ve been a Quicken user since 2000 and have enjoyed the benefits of easily tracking my spending, budgeting, online bill pay and cash flow forecasting for almost all of my adult life. I can still remember pondering the switch to Mac and thinking, “oh great, they have Quicken for Mac.” But that was the last time I thought of a product from Intuit in a positive light. Converting from Quicken for PC to Mac was one of the most difficult software migrations I’ve ever done — and I do them for a living. I spent countless hours on the phone with support trying to figure out why my registrars didn’t balance when I imported my qif files — no, Intuit doesn’t support a direct import, but rather you export everything and import it back in. In the end I made the transition and missed the superior PC version of Quicken, holding my breath as Intuit released paid upgrades to its Mac product, only to realize none of my beefs were addressed. But hey, at least it worked and it had many of the same features I had in the PC world, that was until Lion came along. Faced with the choice to upgrade to Quicken Essentials or to not upgrade to Lion, I bit the bullet and hoped for the best. That hope was unfounded as I lost access to one of my favorite features, online bill pay. For the past 10 years I’ve entered a transaction into Quicken and had it paid by my bank automatically, but not anymore. Now I have to enter the transaction into my bank’s website and then enter it again into Quicken — if I wait for the transaction to clear, which will enter it automatically, I don’t have the ability to forecast my cash flow. That is bad enough, but the budget tool in Quicken Essentials does not work, I won’t go over the details here, but the issues are well documented in the Intuit community forums. And so last month I decided to get serious about budgeting and while a spreadsheet does a pretty decent job at a high level, tracking my day-to-day spending against the budget on a spreadsheet is anything but workable. At first I tried HomeBudget for the iPhone and while it was ok, I found it tedious to enter each transaction manually since it doesn’t link to my bank account. Then there was the Mint upgrade this month, which added budget features, so I figured now was a time to try it again. Mint is actually pretty good at keeping tracking of spending with a great iPhone app and website. I can quickly open it on the go and categorize my spending and see how I’m doing vs my goals in that category. I haven’t tried it a whole month yet, but I’m hopeful it’ll fit this specific need. The problem is, it only fits this one need, and not all my needs as it doesn’t do cash flow forecasting, at all, or bill pay. I can’t even work on a budget until the month begins — typically I like to get it worked out at least a few days in advanced. So here I am over two years after Quicken Essentials was released realizing that Intuit is never going to fix it, never going to add online bill pay and never going to add an iPhone app that syncs automatically. So instead I’m using four applications to do what I used to do with a single app (bank site for bill pay, Quicken Essentials for cash flow forecasting and reconciliation, Mint to track day-to-day spending, and Google Docs for my monthly budget). I’m going to assume that if you have a file with an mkv extension, you know what for. The container is the Swiss Army Knife of containers, but most of the ones I run across have very high quality video and DTS audio. According to Apple, the new Apple TV will only play 1080p encoded with H.264 High Profile 4.0, but that doesn’t seem to be the case. I was able to easily play a few High Profile 5.1 sample clips without converting them. You do have to change the container from mkv to m4v, but thanks to MKVTools (nagware until you pay $5), it takes about as long as a file copy. 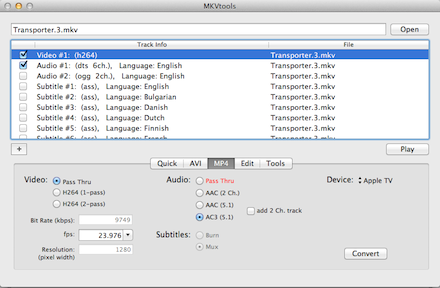 The other great thing about MKVTools is that it will convert the 5.1 DTS audio track to AC3 at the same time — required since the ATV doesn’t support DTS. It really couldn’t be easier. Download MKVTools (I used 2.4.7), open your mkv file, select the streams you want (typically one video and one audio) go to the MP4 tab, choose AC3 and set the device to Apple TV and then hit convert. I’ve only tried samples so far, but they all came out perfect. Drag and drop them to iTunes and then go to Computers on the Apple TV and then to your movies. This might come as a shock to you but Apple doesn’t like to put numbers after its device names. There is no MacBook 20, or an iPhone 2. In fact besides the iPhone 4 and the iPad 2, you’d have a hard time finding an Apple device with a number behind it that meant its generation — Microsoft is also like this, especially considering Windows 7 isn’t the 7th version of Windows. Enough about why the new iPad won’t be called the iPad 3, why am I so sure why the new name will be the iPad HD? One reason “1080p.” Some might argue that the first two iPads had HD displays, and while this is actually debatable (the lack of solid definition for HD has already bothered me) when it comes to modern TV shows and movies, HD means at least 720 lines and 16×9 (at least). This means that the highest resolution you could watch 16×9 content on the older iPads is 1024×578 — not HD by almost any definition. A 2,048×1,536 display on the other hand? It can easily display 16×9 content in 1080p (with pixels to spare all around, wonder if there will be a dot by dot mode). Of course these means that along side the new iPad HD will be the new Apple TV HD and 1080p content in the iTunes Store, which as far as I’m concerned is about time (lets hope for Dolby Digital Plus too). Or in other words, an all around great day for an HD fan. Of course this Retina Display iPad HD will also be good for many other things. Reading a book without being able to see the pixels, as well as any other reading, and video games should be a great improvement — when the developers get around to updating their apps. And , 264ppi is enough to be considered a Retina Display by Apple definition since the average viewing distance of an iPad is further than that of the 330 ppi iPhone. Oh, and I’ve been saying this long before the leaked accessory names. Use a Windows 7 Media Center to record TV, but you also own a Mac? Then go ahead and download VLC 2.0 as soon as you can. 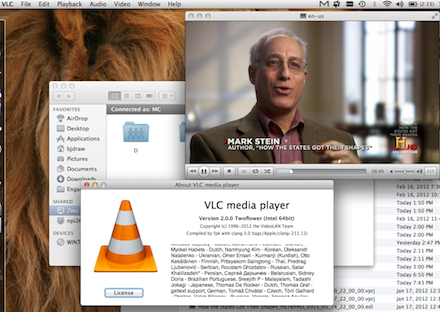 As far as I know, VLC 2.0 is the only Mac app that supports Media Center’s WTV file format. The pervious version definitely supported dvr-ms, but when Microsoft upgraded the default recorded TV format to WTV with Windows 7, it left Mac users with no choice but to convert recordings in order to play them back. VLC 2.0 easily played back my recordings perfectly, but one thing that was missing is the metadata (show name is displayed as ‘en-us’) and the closed captions didn’t seem to work either. Regardless, this is a great way to catch up on your favorite shows while you travel, if you happen to travel with a Mac. This was originally posted on Engadget but it was deemed to be more appropriate here as it is more in line with my personal voice than with Engadget’s. The internet was ablaze upon the release of the Steve Jobs’ biography about a particularly interesting quote that seemed to reveal that Apple would release a TV. This is just as exciting a proposition as it was over four years ago to smartphone users who dreamed that Apple would fix the mobile phone. But the fact is that Apple, and many others, have been trying to “fix” TV for years, and to date we are still stuck with hundreds of channels that have nothing on, a dozen remotes and a textbook example of how not to make a user interface. It seems, though, that people are ignoring another Jobs quote, from just over a year ago at All Things D, that seems to explain very plainly why Apple has yet to release anything more than a hobby. When asked about Apple and the TV market, Jobs’ reply showed how well-versed he was in the TV industry, but the choice quote was “it’s not a problem with technology, it’s not a problem with vision, it’s a fundamental go-to-market problem.” Jobs also explains that Apple made an iPhone and the iPad instead of a TV because there wasn’t a choice, “there was no way to get it to market.” So as much as we’d like to shed the chains that are channels and grid guides, as long as the monopolies that own the wires that run into our homes control the bits that travel over them, there just isn’t a way to change TV. 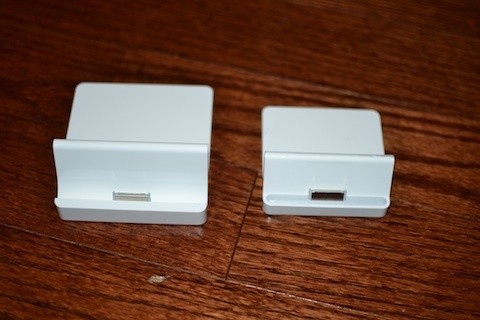 The Apple store didn’t have any docks when I bought my iPad 2 and a few weeks later no dice either. So I broke down and ordered it online and waited over a week. I opened the box and about fell over, I mean the thing is twice the size of the old one. It’s rock steady in it though, but man I hate to think about the size of the dock for the iPad 3. Any good network person will tell you, turn off UPnP on your router! But in many cases it comes on by default, which means that people don’t know that it is on. But what’s worse is that, for most, UPnP is really useful because it will allow applications like Skype and the Xbox Live to open up ports on your home network’s router/firewall without having to understand ports and IP addresses. Not sure why I’m such a gluten for punishment, but I turned on UPnP recently on my FiOS issued ActionTEC router and noticed all kinds of ports being opened. At first reaction, I disabled it and deleted all the port forwarding rules, but then I started to wonder where they were all coming from. My first thought was that I let someone use my WiFi and their machine opened ’em, but I wanted to be sure so after cleaning up all these weird rules, named things like iC5900, I used this post to figure out how setup WallWatcher on my WHS so the next time it’d happened I’d be collecting Syslog data from my ActionTEC router. My thought was I wanted to make sure I had a log since I had no idea when the ports would be opened, but to my surprise when I preceded to enable UPnP, all the ports were opened almost immediately and the destination was my MacBook Air! At this point I figured I must have a trojan or something, but then I noticed it was port forwarding to known services I had running on my Mac like VNC, Skype, and SSH. So the next thing I tried was to set firewall on the Air to essential services only — usually only enable it when I take it off my LAN — delete the UPnP created rules, and wait. This time they didn’t come back. Now the problem is that Bonjour requests that the WAN router open up all the ports that are open on the Mac’s local firewall, which is kinda cool, but not what I want. 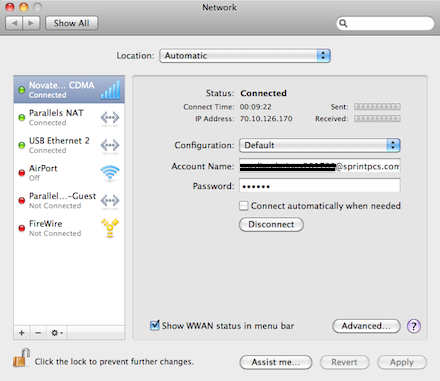 You see while I want to be able to connect via SSH to my Mac while on my LAN, I don’t want to over the internet — otherwise I could control this by configuring the Mac’s firewall. The easy solution is to just disable UPnP on the router, but I have to say that probably won’t work for many people because they don’t understand how to manually configure their firewall. The other option is to disable Bonjour completely, but then the LAN services won’t work either. For now I’m just going to go back to manually configureing my router’s port forwarding and turn my Mac firewall on when I take my Mac about. There is one cool OSX command I learned along the way, like how to tell which applications are communicating on port 22. This lsof command is basically a more useful version of netstat on the Mac, which evidently will also tell you which files are open.